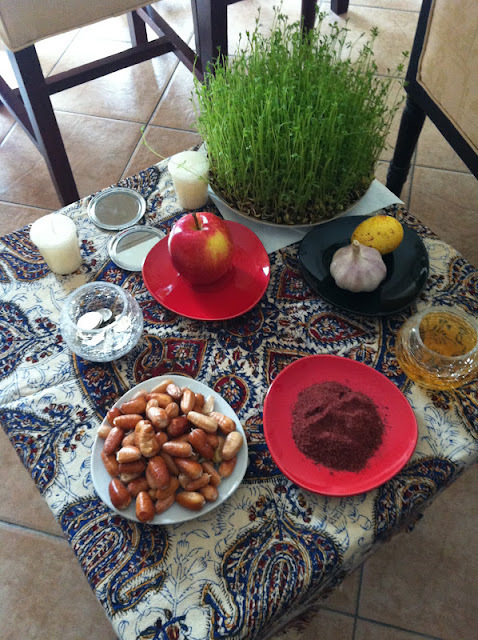 We had lunch at N's place where she had the Nowruz items arranged. Everything begins with "S" in Farsi. Nowruz (Persian: نوروز‎) is the name of the Iranian New Year in Iranian calendars and the corresponding traditional celebrations. Nowruz is also widely referred to as the "Persian New Year". Haft Sîn (Persian: هفت سین‎) or the seven 'S's is a major traditional table setting of Nowruz, the traditional Iranian spring celebration. The haft sin table includes seven items starting with the letter 'S' or Sīn (س) in the Persian alphabet.